Here at HeatCageKitchen, we strive to bring you the hip new trends in cooking and kitchen stuff. Up-to-date tricks and of-the-moment trends that you just can’t live without whether you’re just starting to cook or have been in your kitchen for a long time. The goal is to bring you these new trends that you just need to know before your friends know. I’ve got an update on my cappuccino machine and a new idea that crossed my Facebook path that I’ve got to tell you about. If you haven’t heard about this already. Your friends will be amazed. Keep reading. . . So, I was thinking that although it would be lovely to go out and buy a brand, spanking new cappuccino machine, the thrifty side of me says, no, it’s just the frothing part that doesn’t wanna work anymore. I have on occasion seen hand-held milk frothers in different places. This evening, for the project I’m about to tell you about, I headed to Cost Plus World Market and discovered that they have these little babies at $2.99 each. They run on 2 AA batteries (like nearly everything else I own, right?) and they froth up milk. They don’t HEAT milk, they only froth it up. Online, they sell them in a set of 3 for $8.97, but in the store they sell them individually. I bought the green one, the first one the clerk handed me. I headed to Target to get a big 20-pack of AA batteries. You never know when the milk frother is going to go out. Or the TV remote. Or the flameless candles on my altar. Or some other little thing that uses batteries. I used to carry a Sony Walkman–yes, a cassette player, and later, one with a radio–in the pre-iPod days. And I can tell you that the batteries that lasted the longest were coppered, so that’s what I buy. And nobody paid me to say that. Anyway. . . So I put some milk in a measuring cup and warmed it in the microwave, then used the handheld milk frother to froth up the milk. It worked perfectly, and for $2.99, I now have perfectly frothy milk again when I make cappuccino. Woo hoo! Wal-Mart also had an electric milk frothing pitcher, but that one was $35. Very nice, of course, but that’s OK. I’ll continue to steam the milk and then use the little battery powered frothers. That’s perfectly OK with me! OK. . .now. . .this is a most momentus thing I’ve discovered, and it’s cheap. I LOVE salad, and yes, iceberg lettuce as well as Romaine, butter and red-leaf lettuce, but it tends to go bad on me, even when I keep on it. I hate that, so as a result, I don’t buy it too often. A solution has been found. I am testing this as I type this. 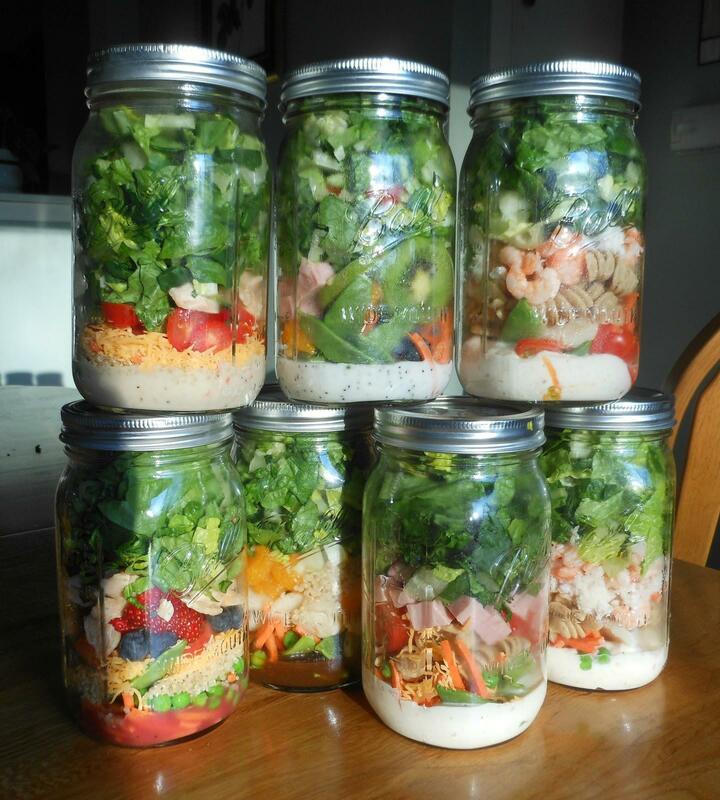 Let me say first that this is NOT my own idea, but the brilliant idea of one Paula Rhodes, who has a website. . .Salad-In-A-Jar.com. No kidding. I came across the idea, as many, on Facebook. Such a simple idea, but you absolutely MUST seal the jar and get all the air out to prevent browning of the lettuce. Another idea where I wish I’d thought of it, but. . .well, you know I’m not smart enough for that. (I went to college at night.) Well, I did figure out that Scrubbing Bubbles will clean your kitchen cabinets and other surfaces by melting off the dirt. That’s another blog post. On my trek out I went first to Cost Plus World Market for the jars, which are $2.49 there. I also have a couple of jars that I kept after the Classico Tomato and Basil is gone. The process is the same for both types of jars, but there is an essential step that you must do. You MUST vacuum seal the jars and get all the air out. I am not suggesting you get one of those expensive Food Saver sealing thingies, although if you have one, you have an advantage, there is an attachment for wide-mouth jars and a tube for this purpose. Maybe one day I’ll get me one, but for now, I just want cheap. That’s the real secret of HeatCageKitchen. Livin’ on the edge (of the kitchen). Cheap. So if you’ve ever seen those Ziploc vacuum seal bags, well, there’s a vacuum pump tool that comes in the starter kit, runs about $4 or $5. Well. . .the directions are to wash and spin-dry your lettuce, chop it, put it in the glass jar, put the lid(s) on it, put a small hole in the top with a pushpin, put a small piece of electrical tape over the hole (don’t seal it), and use the vacuum tube to pull the air out. Utterly brilliant, people. Not only does SALAD IN A JAR save space in your fridge, it also reduces food waste and gets non-salad eaters (me) to mow down daily. Is that not the coolest idea ever? And it’s SO SIMPLE. So in the HeatCage Test Kitchen (ha, ha) I have purchased said Ziploc vacuum tool at Wal-Mart, as well as jars and the milk frother at Cost Plus World Market, and lettuce (and a few other things) at Target. (I went to Target first, they didn’t have it, darnit.) I have three sealed jars of lettuce in the fridge, right now, and am thoroughly excited about this. Simple, using readily available modern conveniences. I love it, and am hoping for the best on my end, too. I’ll let you know what happens next. Since I my life will be soon become very busy, this will be a great help for my weekly food prep. You see, since I was a full-time working student at Tulane University (1991-1996), I do all my weekly cooking and wardrobe prep on Sunday, so that I don’t have to do as much during the week. (The crock pot cooking helps a lot, too, especially if I didn’t get it all done in time.) When I was getting home late at night, that Sunday ritual was a lifesaver. If I missed one thing, my whole week was messed up. Bad. Salad, much as I love it, hasn’t been a staple for me, since I don’t buy it as much, it turns brown so fast on me. I’m hoping this experiment will work. I do love salad, and hate throwing anything out. You can read all about it at Paula Rhodes’ Salad In A Jar website, plus lots of other of her recipes and ideas. (You can bet I’m subscribing now!) You can also see her video on YouTube doing exactly what I described. If you try this, let me know how your experiment turned out. Posted by Amy on April 11, 2013 in Fast & Easy, Health & Wellness, Ingredients, New Trends, Tricks of the trade, What's for Dinner?